There was a sublime moment in San Francisco last night when the Giants who had rallied from the brink of elimination twice (or six times depending how you look at it) and were on the field with just three outs to go in a massive downpour. Credit Fox for providing cinematic pictures of a triumphant celebration in the rain. It was the ultimate victory over adversity. The Giants had lost Second Baseman Freddy Sanchez and Closer Brian Wilson with season-ending injuries before their years had even started. They lost MVP candidate Melky Cabrera with two months to go, suspended for PEDs. Their Ace Starter of previous years, Tim Lincecum, wasn't even a shadow of His Freakishness. They watched their main rival in LA pick up a handful of household names from the Red Sox in a late-season trade. 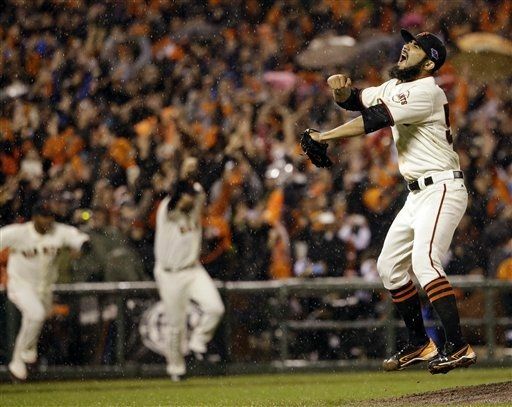 With everything thrown at the Giants, it only seemed to make them stronger. And ultimately, for the last hurdle, they only had to outlast the elements. Now the Giants battle Detroit in what should be a great World Series. It should also be cosmetically pleasing, with the second and third best uniform combos in baseball (they climbed up the ladder since the Expos moved to Washington). Now the Giants find themselves in a disadvantageous position again. The Tigers come off a sweep of the Yankees and their pitching is set up. They also have the toughest out (Miguel Cabrera) and the best pitcher (Justin Verlander) in the game. But if the Giants show the type of spirit and team unity of 2010, and they have thus far, you'd be a fool to write them off.